I got the Storybook Cottage Dollhouse by Greenleaf. I thought it had nice lines for a beach house. 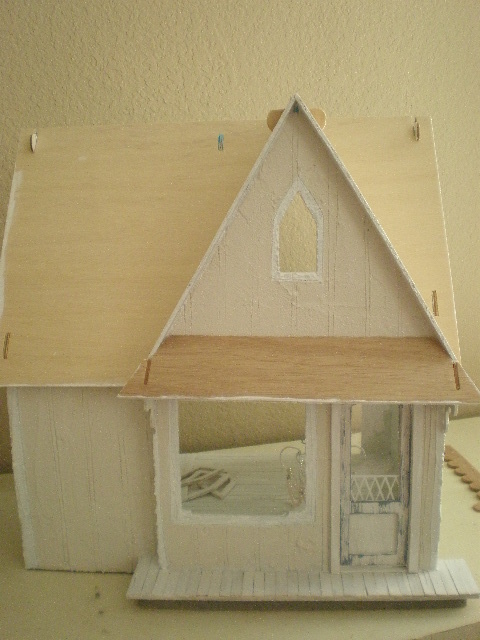 I painted it cream with white trim. 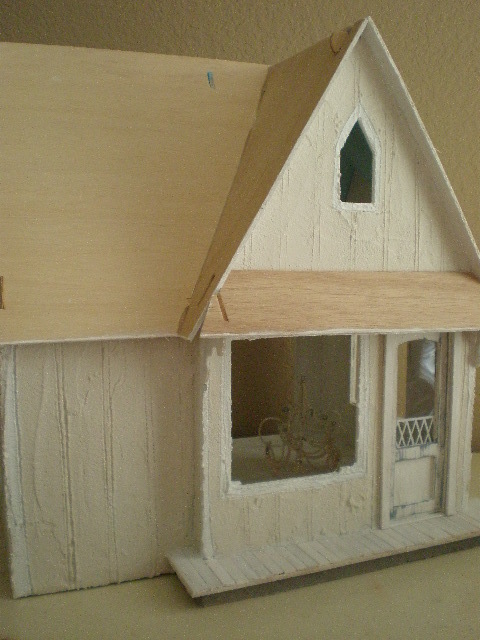 And I left off the bay windows. 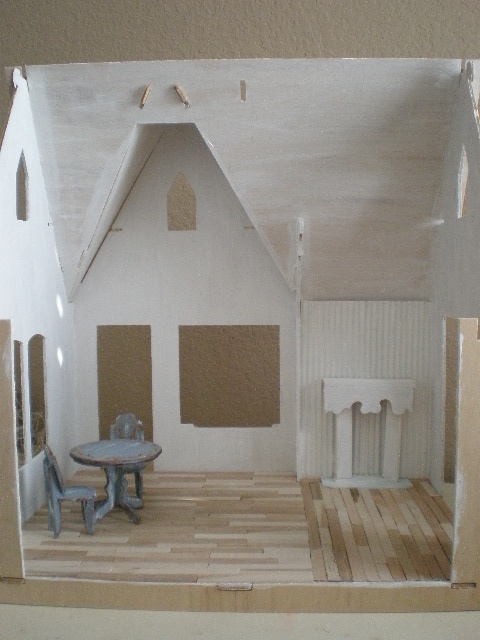 The little table and chairs came with the kit. I saw a table painted like this at a model home I visited. 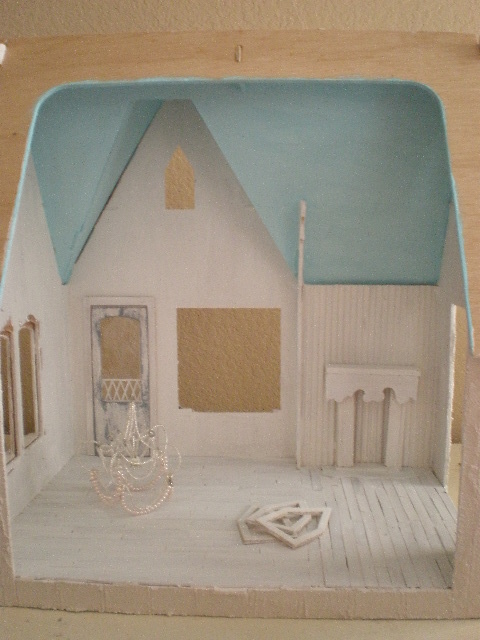 I'm totally obsessed with painting the ceilings of the dollhouses blue! Everything else will be white.I made the little fireplace mantle from leftover wood of the kit. I have the chandelier mostly done. i love seeing you work your magic! What a fabulous beginning! I love it already. I think painting the ceiling blue is a great idea. How did you get the edges of the roof so rounded? And I see the tabs no longer show either? Well done! Colours are beautiful. Lovely work! The blue ceiling is so gorgeous- I can see why you are compelled to paint them blue :) I love your little table and chairs too- beautiful!!! Seguro que te va a quedar una casita de playa preciosa, el color azul le va genial. Volvere para ver los avances. Por cierto me encanta esa mesita. Your little beach house is looking amazing. 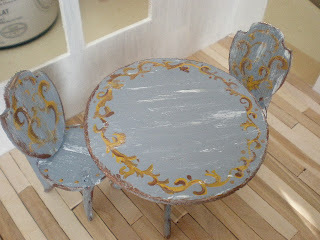 I love the table and chairs and how you have painted them. I have been lucky so far with being able to leave comments tonight. I hope it continues because I have about three blogs left to visit before I call it a day. Have a great weekend. Your Missouri friend. Sooo pretty! I love it! Can see you are working on a beach house, that should be neat! I have a surprise for you, so come over and read and find out why.